More than 1.4 million men and women serve in the Armed Forces; 325,000 of them are deployed outside the United States. As these brave individuals stand guard for our freedom, they miss important holidays, special, personal moments and the simple joys of being with friends and family. 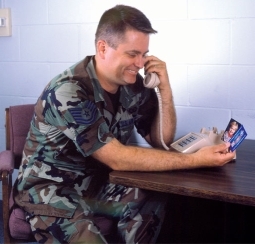 With your generous donation, Operation Uplink provides free phone cards to deployed troops and hospitalized veterans to help keep them connected with loved ones. How did you hear about Operation Uplink?